IT’S nearly Christmas, so it must be time for … ballet. 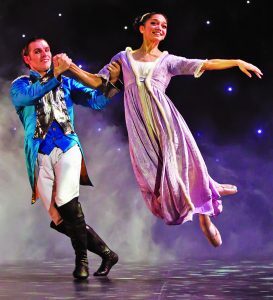 For fans of classic dance, The Nutcracker has become synonymous with the festive season and Northern Ballet’s production fits the seasonal bill nicely. Set in the midst of a yuletide party, as the fire crackles and the pile of presents grows ever higher, Clara is caught up in the warmth and excitement of Christmas and becomes enthralled by her new Nutcracker doll. But, as the clock strikes midnight, her Nutcracker proves to be no ordinary toy. For lead dancer Rachael Gillespie playing Clara is a dream come true. “The Nutcracker was the first ballet I ever saw.” she recalls. “It was a different production, on TV over Christmas when I was young and my mum recorded it for me on VHS. I just remember loving it so much that I watched it over and over again. “I think I must have been about seven. I just remember how I loved all the costumes, music and that there were ballerinas in pointe shoes! Little did I know back then it’s not as effortless as it looks! Rachael says she particularly looks forward to the snow scene each night, when Clara and her Nutcracker Prince dance together for the first time. “It’s a beautiful scene. It’s so Christmassy; the costumes, the music, but most of all, the beautiful Snowflake ladies,” she explains. “The dance itself, although it may look effortless, entails months of hard work before it goes on stage. And of course it has that festive touch. “Everyone loves to see a show at Christmas, and The Nutcracker is definitely one to go to see to celebrate and enjoy the festivities!” says Rachael. “For many it even becomes a tradition. Whether you’re a ballet fanatic or it’s your first theatre experience, it’s definitely one of the best shows to see. Northern Ballet will bring The Nutcracker to the New Victoria Theatre, Woking, from Tuesday (27 November) until Saturday 1 December.